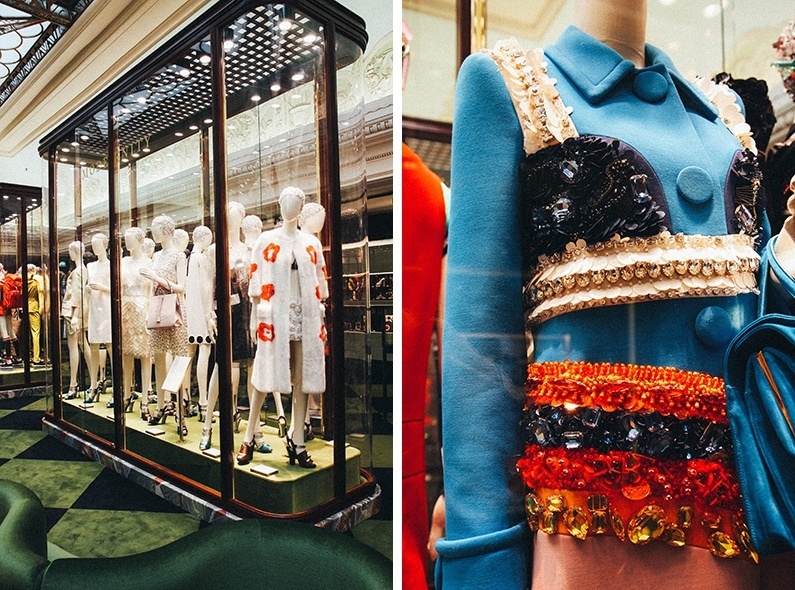 Pradasphere is Prada’s latest exhibition, situated on the fourth floor of Harrods. 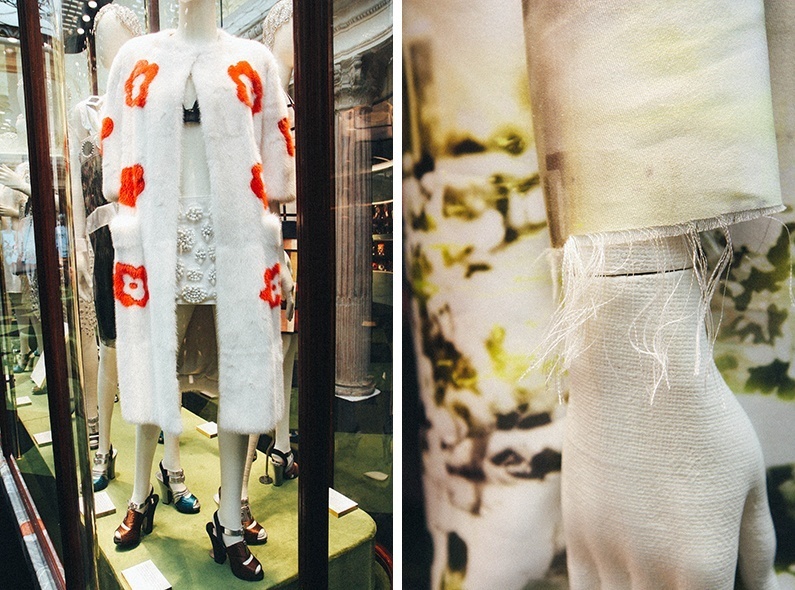 Don’t you love how department stores have become a place to see art? I wonder whether the next generation’s Jeff Koons and Damien Hirst will exhibit exclusively in them. 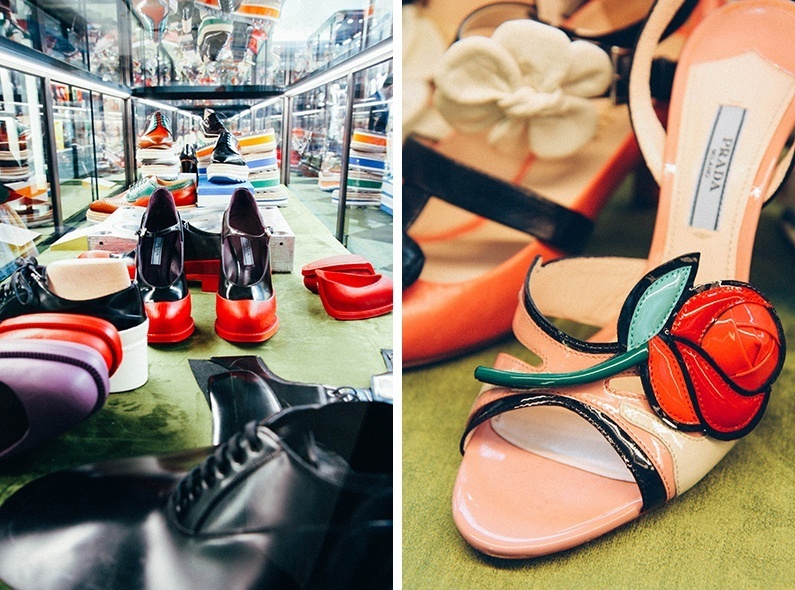 For now, there is Prada. 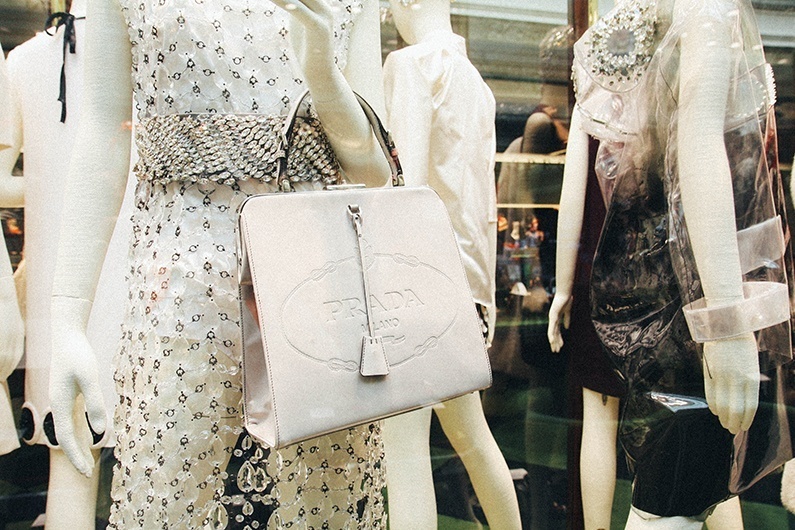 Pradasphere is curated by Michael Rock, who has collaborated with Prada for more than 15 years. His main inspiration for the exhibition was taxonomy — the classification of objects. 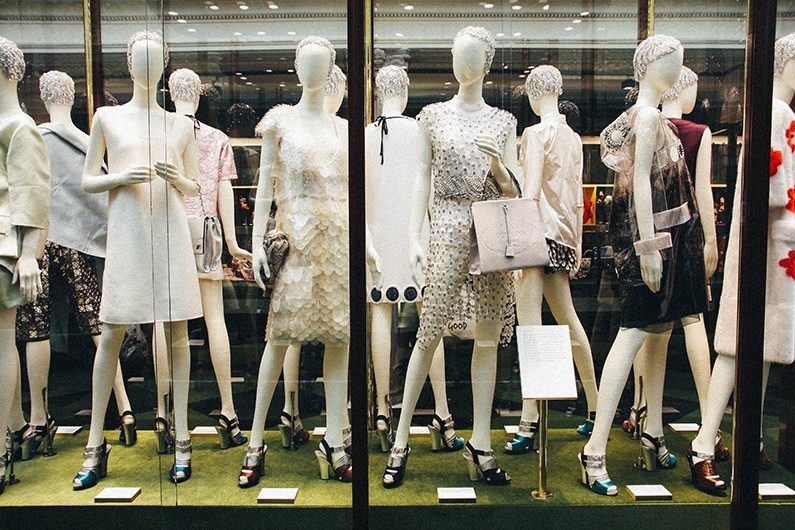 Prada looks are displayed in six vitrines corresponding to six themes-typologies: Modernity, Continentalism, Excessivity, Animality, Figuration and Femasculinity. 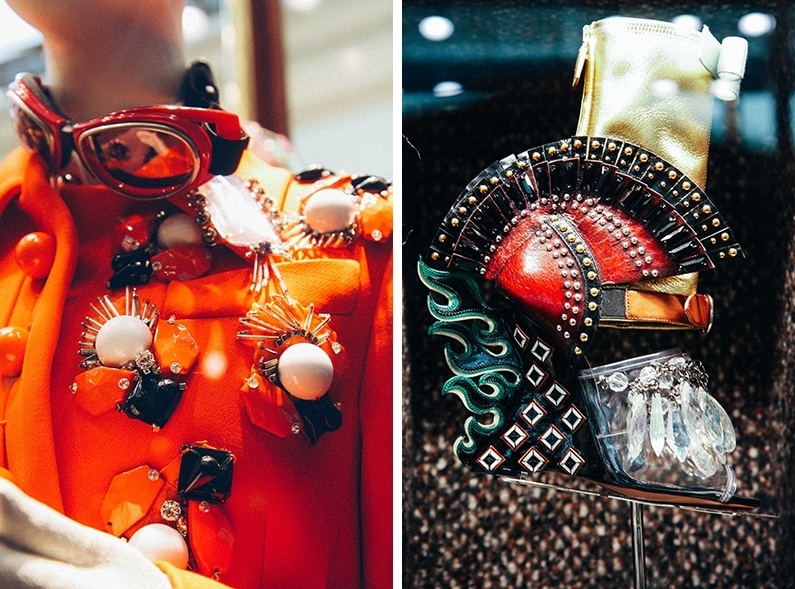 The exhibition shows how Prada evolved from its eighties and nineties minimalism into an explosion of colours and embellishments. Whether on purpose or not, the exhibition couldn’t be more Instagram-friendly. Sparkly appliqués, plastic gemstones in bold colours, funny keychains and other trinkets beg to be captured with smartphones. Everything you could possibly want to photograph is well-lit. Even the staff encourage you to take photos. I never thought I’d see the day! There’s nothing worse for an exhibition-obsessed blogger than having to use press office photos in your posts. Readers have seen them elsewhere and they’re someone else’s experience of the exhibition that doesn’t necessarily match mine. 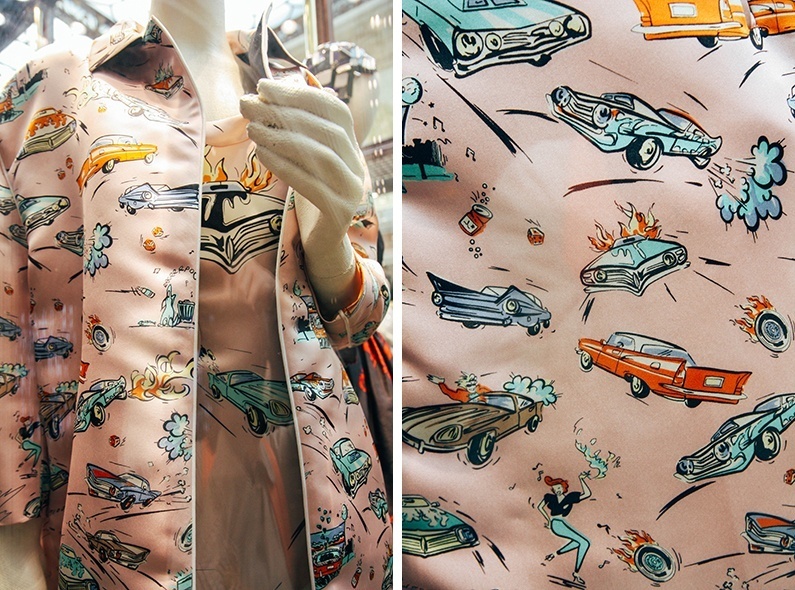 Prada understands. Hidden behind one of the walls so expertly that I’d never notice it was there had my tour guide not shown me, is a small Prada boutique. 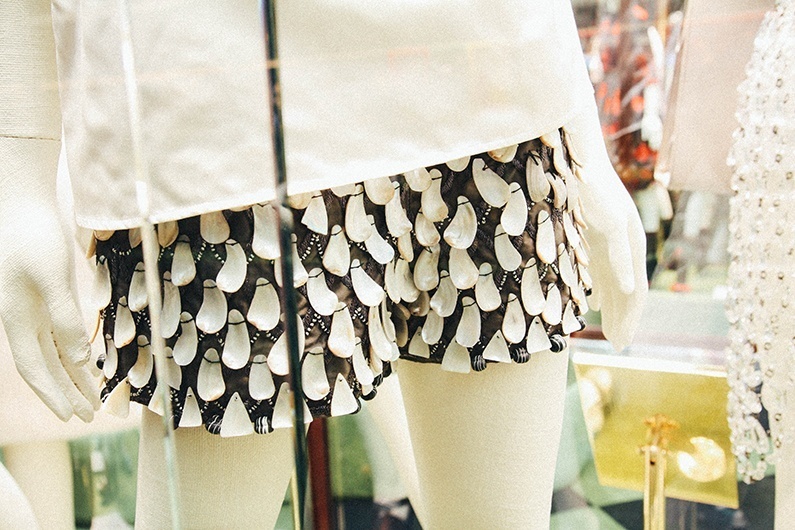 It sells the Pre-Fall 2014 collection including pieces exclusive to Harrods. 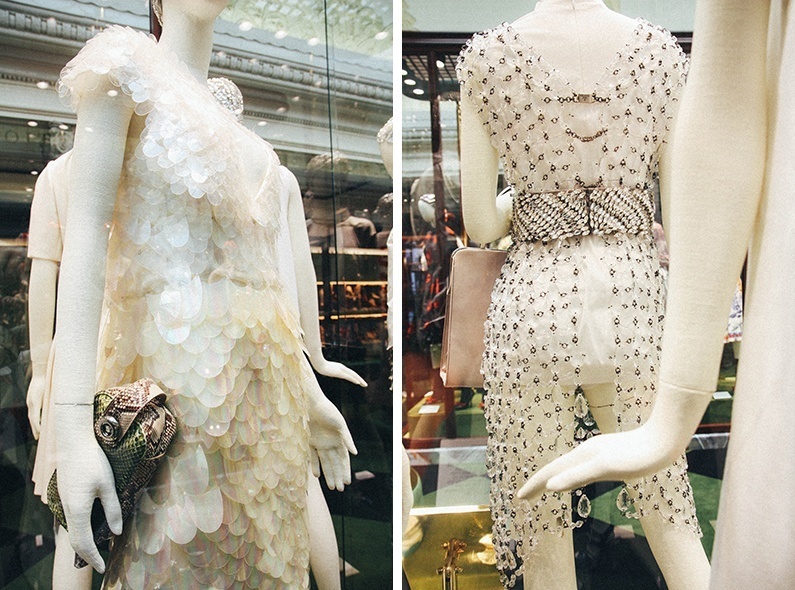 Harrods learned from their mistake of not having set up a retail space within the Dior in-store exhibition last year. Why not rake in an extra £20,000 a week if you can? I don’t appreciate that everything revolves around selling these days. On the other hand, the Prada store is unobtrusive enough that only those specifically looking to shop will find it. 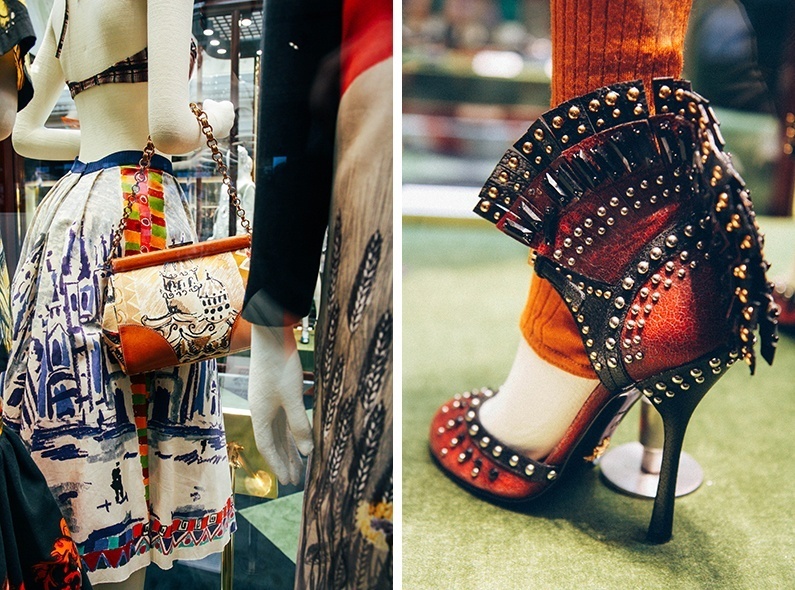 Prada-suited guides with impeccable manners and knowledge give comprehensive and inspiring tours of the exhibition. 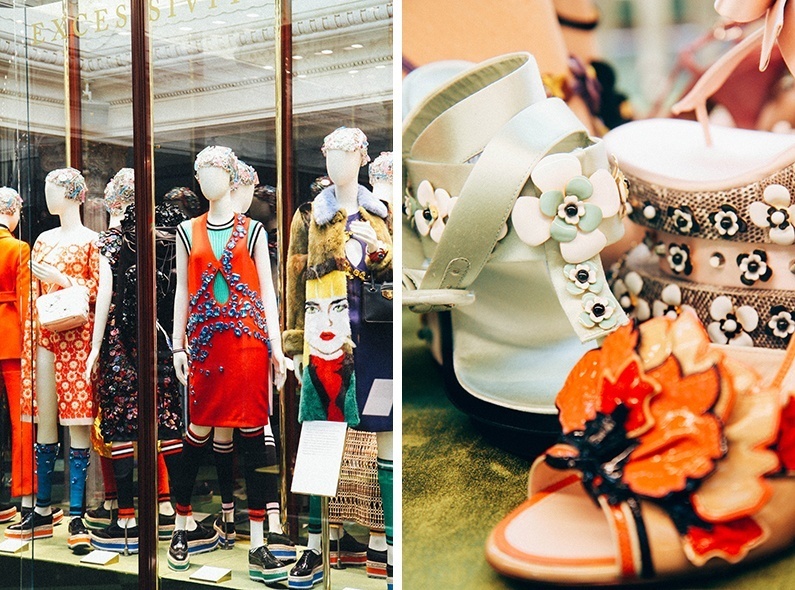 They teach you to really look at Prada and understand its ethos of (a) contradiction and (b) provoking a reaction with clothes instead of words. 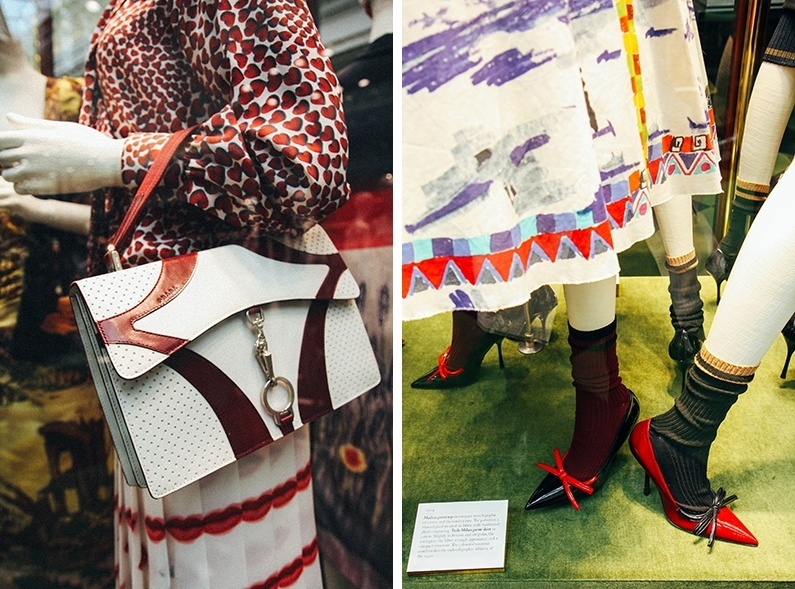 I walked in knowing quite a bit about the brand and left with oodles of new information about Prada’s history, its association with sports and other influences. It’s remarkable that Harrods provides exhibition goers with such excellent “customer service”, even if you’re just looking, not buying. 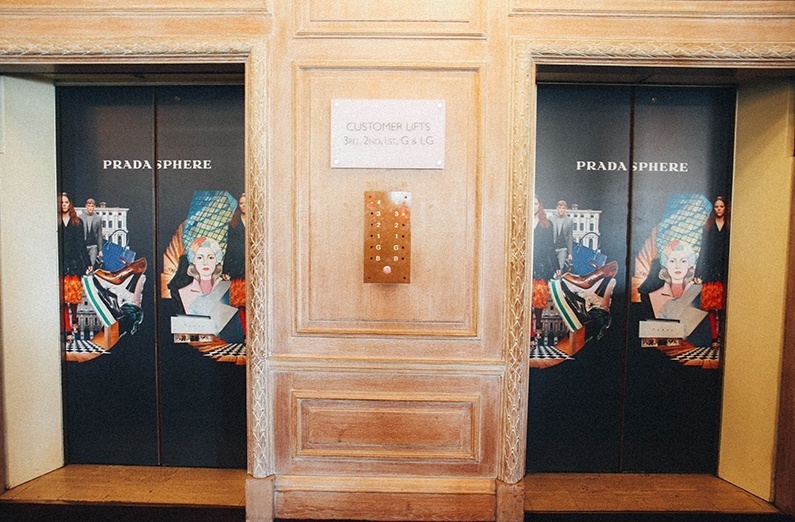 With its clever ties into retail and social media, Pradasphere is not only beautiful, but also one step ahead of others. 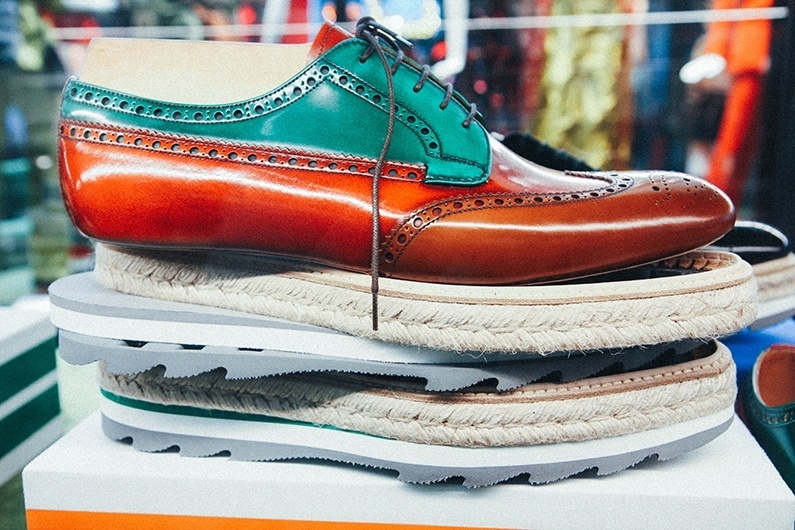 Not that you’d expect any less from Miuccia Prada.